It’s been a while since the last Draftail release! Draftail v1.1.0 is out; the CHANGELOG is fairly short but I thought it would also be good to report on what’s been happening behind the scenes. This release comes with a new feature – support for form validation (and more), with onFocus and onBlur props for the editor. Thanks to @TheSpicyMeatball for making this happen. Prevent crash when filtering pasted content whose last block is to be removed (e.g. unsupported image) (#179). None of those bugs were that critical, but I’m particularly happy to see them addressed because the reports came from users of Draftail I didn’t know about. 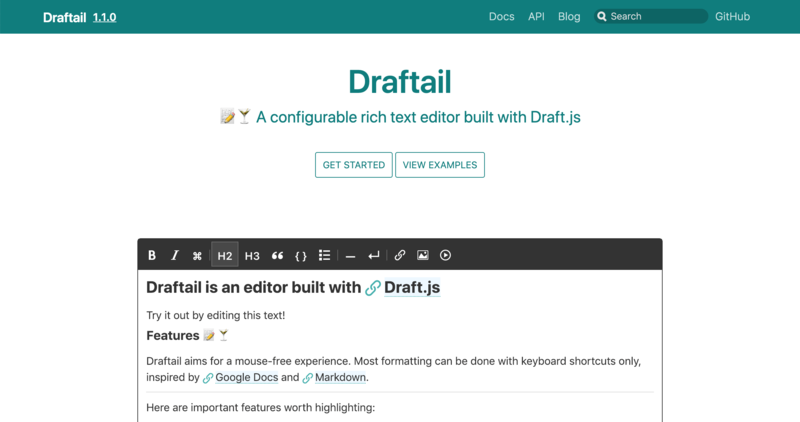 Draftail was originally developped for Wagtail, but we spent a great deal of effort to make sure it would be usable (and good!) outside of the CMS as well. It’s good to see others using the editor, and contribute to its maintenance. Integrating Danger onto the project, an automation tool to vet pull requests. Danger helps enforcing the parts of the software development process that are not automated: keeping the documentation up to date, making sure new code comes with tests, assessing new dependencies added onto a project, etc. Splitting Draftail’s most important overrides of Draft.js into separate packages, draftjs-filters and draftjs-conductor, so others could use the improvements, and help with the maintenance. Combined, those two packages get 20x the downloads of Draftail. Adding stylelint to lint styles (#126), with my custom styleling-config-cookbook configuration. CSS being a very permissive language, I find it especially important to have strict checks there. Did I mention something about languages being too permissive? Well, the editor now also uses Flow types (#127) to keep JS under check. This actually already helped surface some of the bugs fixed in this release, as well as potential sources of crashes in the editor, so thank you Flow! I also added performance tests (memory, CPU), to be able to benchmark future additions to the editor. Last but not least, Draftail also has new documentation and demos! The Draftail documentation used to consist of a very long README, which kept things simple, but also very (very) short. Now, everything lives at draftail.org, a brand new website built with Docusaurus! It’s easier to navigate around bigger documentations. To me, good, extensive documentation is one of the hallmarks of great software. Because of the ease of navigation, docs can be redundant – e.g. cover the same topic with an intro, a full-fledged guide, and an API reference. Docs can be versioned. READMEs are versioned too, but people often do not realise they can use GitHub’s branch/tags navigation for this. Search! draftail.org’s is built with Algolia DocSearch. Finally, the last thing I love about this new documentation is that it can contain live examples of the editor in iframes. As part of Hacktoberfest 2018, the examples / demo / playground site for Draftail was rebuilt with Storybook (#163). Demo of the editor’s theming capabilities. The left-hand menu lists all of the demos/stories. Here as well, compared to the previous two-page site, this has made it possible for me to build (and keep organised) many more examples, as well as having separate self-contained examples for all of the parts of the API. Storybook also happens to be a great development environment, with great hot reloading capabilities and custom UI panels to help with development. I’m really happy with how easy to maintain the editor is because of all of those changes. It’s easy to be confident in code changes because of the extensive linting and tests. 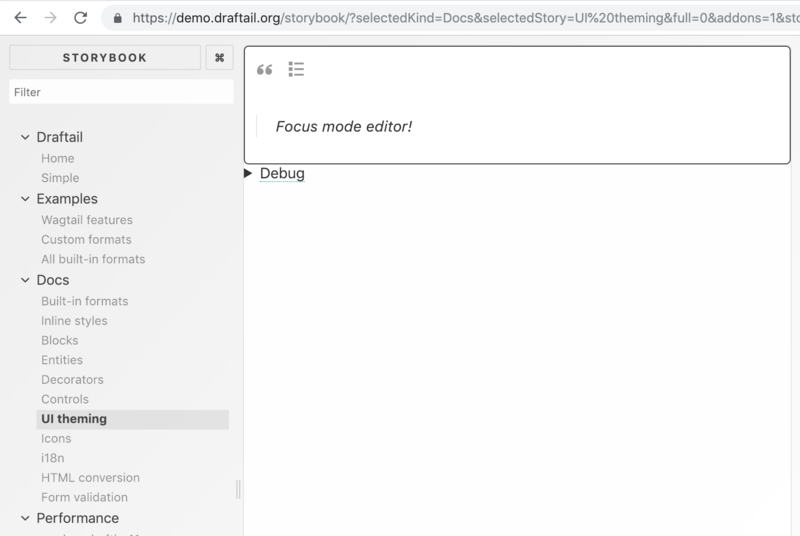 The ease of changing documentation and creating new demos makes it easy to support people trying to solve specific problems with the editor. More than anything, I’m happy that the new documentation makes it easier for people outside of the Wagtail world to use the editor. Now, onto new features! If you want to keep track of how this is all coming along, have a look at the WIP draft-js-plugins compatibility pull request, and come chat in the #draftail Slack channel.